The LORD been having me read second Timothy and that’s what I’m gonna share this morning. It kind of goes with the preaching I did a little while ago about how we don’t know what tomorrow brings. 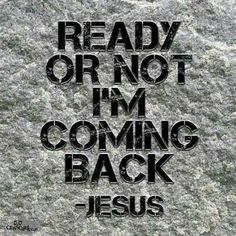 This is not doom and gloom, it’s about how excited we should be that the end times are here and well in heaven with JESUS. Paul writes to Timothy a second letter and he talks about everyone needs to be ready because the end is near. He also talks about spreading the Gospel. That’s what we need to do and not stop ’til we see HIM face to face. In the second chapter, Paul gives encouragement to Timothy to be determined to spread the Gospel and to have others spread the word. He also tells him to endure this race until the end. Whether it’s the end of his life or when the LORD comes. That’s another thing we need to do is to endure ’til the end. That’s why we need to be there for each other. To encourage one another as the body should do for each other. Then Paul tells Timothy in chapter 3 how crazy the world is gonna become in the last days. Evil things and wickedness will increase. Moral standards will get worse. People will start believing anything the world throws at them. Even churches are changing their views. As we stay strong in JESUS and get stronger in HIM, we will still see a great outpouring of the Holy Ghost. People getting Baptized in JESUS name. We always have the hope in JESUS. Whatever is going on in the world, in this country, in your neighborhood, in your families, we need to finish the race because we are victorious in JESUS. HE is our Hope that we get to heaven to be with HIM. HE gives us hope to endure. To get through the valleys. To stand strong against the enemy. To endure til the end.